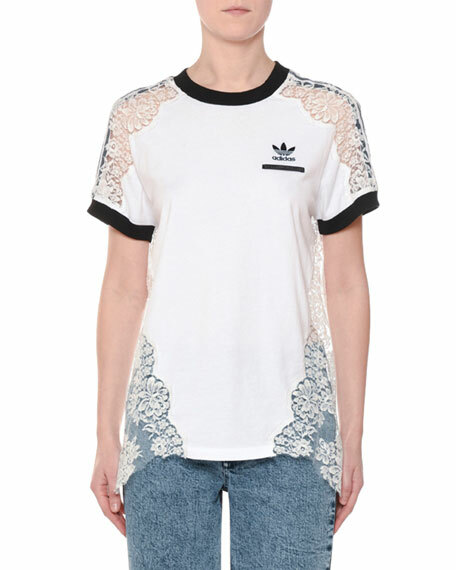 Stella McCartney Adidas T-shirt with lace insets. Coach tee featuring T-rex logo. Crew neckline. Short sleeves. Relaxed fit. Slipover style. Cotton. Made in Peru. Model's measurements: Height 5'10"/177cm, bust 33"/84cm, waist 25.6"/65.2cm, hips 35.8"/91cm, dress size US 2-4/FR 34-36. Johnny Was "Burke" floral embroidered knit tee with knotted front hem. Scoop neckline. Short sleeves. Relaxed fit. Cropped. Tie-front hem. 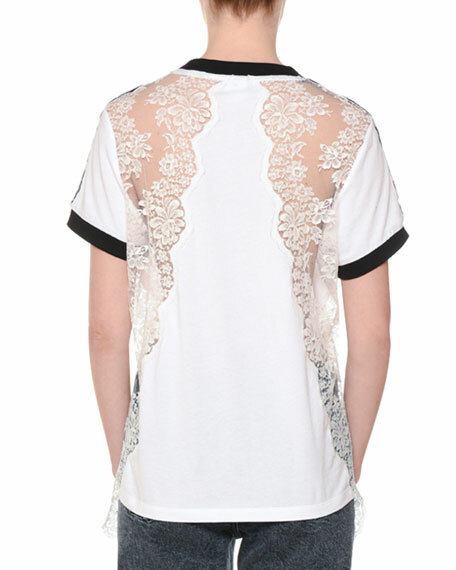 Johnny Was "Burke" floral embroidered knit tee with knotted front hem. Scoop neckline. Short sleeves. Relaxed fit. Cropped. Tie-front hem. Pullover style. Cotton. Imported. Please note: This merchandise may have a distressed effect. It is a unique feature that enhances the product and is not considered a defect. Made on Grand T-shirt with topstitching. Crew neckline. Long sleeves w/ M.I.N.E patchwork. Relaxed fit. Pullover style. Rayon from bamboo/cotton/spandex. Made on Grand T-shirt with topstitching. Crew neckline. Long sleeves w/ M.I.N.E patchwork. Relaxed fit. Pullover style. Rayon from bamboo/cotton/spandex. Made in USA of imported materials. Model's measurements: Height 5'10"/177cm, bust 33"/84cm, waist 25.6"/65.2cm, hips 35.8"/91cm, dress size US 2-4/FR 34-36.